While they are rare, black sand beaches exist all over the world wherever there are volcanoes and where, after a millennia, the waves, rains and winds have eroded lava rocks into a fine sand. Most black sand beaches are in tropical places like Hawaii and the Philippines or in the Mediterranean such as Italy and Greece, but there are some beaches covered in black sand where you cannot simply jump into a warm surf, in places such as Alaska and Iceland. In Hawaii the beaches can have white, green or black sand, thanks to the constant and recent volcanic activity on the islands. If you would like to discover how it feels to walk on black sand, head to Punaluu Beach on the southeastern Kau coast of Hawaii Island. Snuggled between Hawaii Volcanoes National Park and the town of Naalehu, this beach is fringed by stately coconut palms and the hot sand attracts giant Hawaiian green sea turtles. 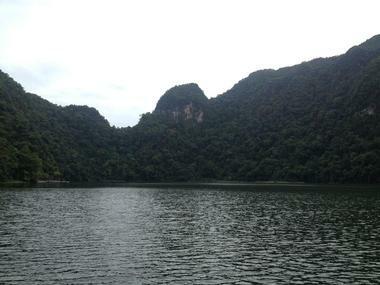 Both the turtles and the black sand are protected, so do not disturb the turtles and do not take any sand. Swimming on the beach is not perfect but possible while the wide space and the shade of palm trees make it ideal for picnics. 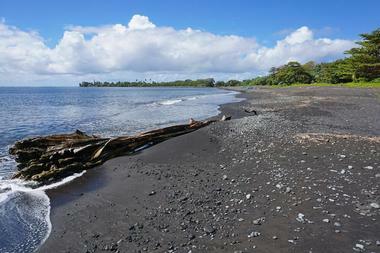 While there are other black sand beaches in Hawaii, Punaluu Beach is considered one of the most beautiful. 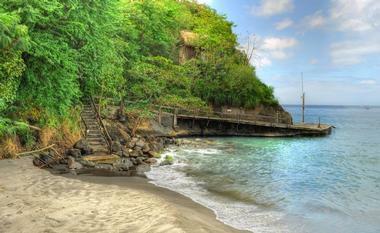 If you want to swim in the warm, calm waters of St. Lucia, go to the beach on its protected, Caribbean side. If you want to work on your tan and watch the powerful Atlantic waves wash the shore, find a beach on the eastern side of the island. 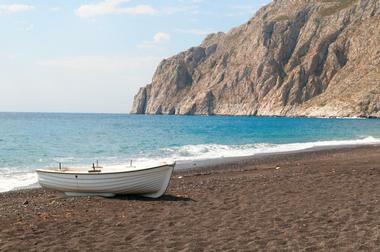 All the beaches are magnificent, and most of them have black sand, a consequence of island’s volcanic origin. Part of the King Range National Conservation Area, Black Sands Beach is a 3.4-mile long, fairly wide black sand and dark pebble beach at the end of the 20-mile long coastline between Shelter Cove and Mattole River Campground. Its hard-packed sand is wonderful for long walks and beach combing. 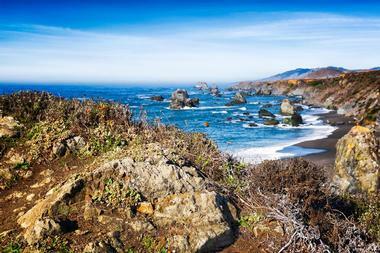 From the beach you can take the Lost Coast Trail north to many wilderness camps and remote hiking spots. When backpacking across the beach, plan carefully as parts of the beach get inundated by the high tide. There is an offshore reef that protects the beach. Swimming is possible as long as you take care. 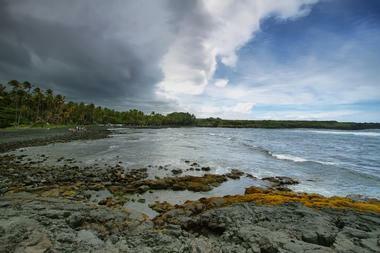 At low tide, you can walk all the way to Little Black Sand Beach. Cahuita is a small yet lively village on Costa Rica’s Caribbean coast, about 27 miles from Puerto Limón. As the highway from San Jose to Limon has recently been completed, the area is only just being discovered by tourists, so you can often find beautiful Negra Beach, or Playa Negra, fairly empty. Located on the southeast end of the beautiful Greek island of Santorini, Kamari is an upscale beach resort overshadowed by the steep slopes of Mesa Vouno, with a magnificent black sand beach and the ancient city of Thira that dates back to the 9th century. The beach is well-organized and lined with lounge chairs and umbrellas and it can get fairly crowded. Wai‘anapanapa State Park is a 120-acre tropical paradise on the Hawaiian island of Maui with a unique and spectacular black sand beach, sea stacks, stone arches, lava caves and blowholes. The fine black sand was created by thousands of years of powerful surf pounding the volcanic basalt rocks that surround the beach. Located on Malaysia’s west coast is Langkawi, a breathtakingly beautiful archipelago of 99 islands surrounded by blue sea and covered with lush tropical jungle mixed with rice paddies. The main island is famous for its fantastic diving sites at the Underwater World Langkawi at Pantai Cenang, the cool cable car in Pantai Kok and the beautiful Black Sand Beach nearby. Only about a 20-minute drive from the cable car, the beach is a lovely, serene retreat from the better-known and often crowded island beaches. The beach is particularly popular among locals, who like to gather on the beach at the weekend. The black sand is mixed with white sand and legend has it that it is black because a mermaid cursed it when a fisherman stole her ring. If you are tired of crowds on the beaches of southern Bali, head north to the beautiful Lovina Beach, just west of Singaraja. 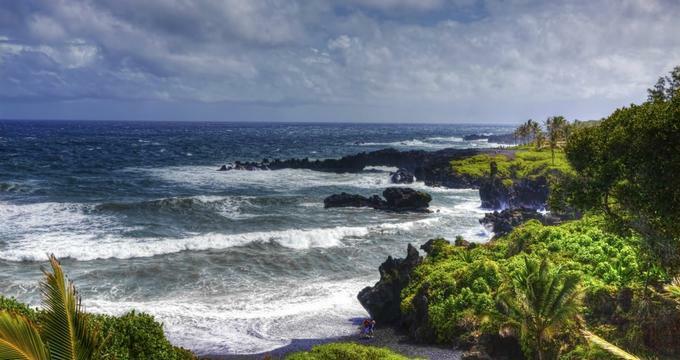 This tranquil 12 km-long stretch of fascinating volcanic black sand is much loved by locals and is swiftly being discovered by tourists, especially Australians during the Christmas holidays. The beach is wide and flat, great for taking a sunset stroll, and is lined with ancient trees, shops, restaurants and dive shops. 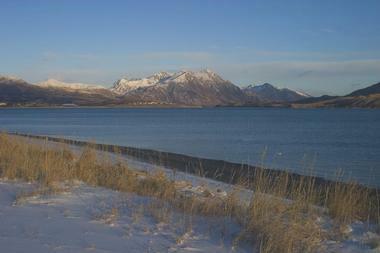 The largest village on the beach is Kalibukbuk and there are also a few luxury resorts as well. You can visit the healthy offshore reef straight from the beach at Kalibukbuk by snorkeling or diving, or you can simply lie on the beach and enjoy a soothing massage while drinking a fruity cocktail. About 15 km from the village of Fira on the southeastern end of Santorini is the 7 km-long beach Perissa, one of the most beautiful on this side of Santorini. Like most Santorini beaches, it is covered by black volcanic sand created by millennia of wave action against the dark volcanic rocks that shadow the beach. The sand gets very hot during the day, but it keeps the waters of the Aegean Sea crystal clear – great for swimming and snorkeling. The beach is dominated by the looming, almost vertical slopes of Mesa Vouno. The mountain is great for exploring since it is home to the ruins of the ancient town of Thira. There is a narrow path you can hike or ride along on a donkey. Perissa is also known as a party beach that is popular with backpackers. 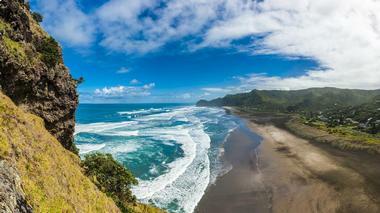 Located on the west coast of New Zealand’s North Island about 40 km from Auckland, Piha is New Zealand’s most popular and best-known beach. The beach is famous for its fascinating black iron sand and fantastic surfing – New Zealand’s first surf boat race was at Piha in the 1930s. The sea is often moody and mysterious and the dark beach looks wild and wind-swept. Located on the north coast of Tenerife, one of the beautiful Canary Islands, is the quaint touristy town of Puerto de la Cruz, which is famous for its large, wide black sand beach. The beach is unique in many ways. It was designed by the famous local artist César Manrique. To enter the beach, a promenade leads you through the lush gardens full of native Mediterranean plants and trees, surrounded by waterfalls and stone walls. On the beach, you can find lounge chairs and umbrellas and spectacular views of the surf and the slopes of Mount Teide. A lateral breakwater protects the beach from the rough waves, but there are several open areas for surfers. The garden behind the beach has kids’ playgrounds, cafes, terraces and a concert stage. Point Venus is low, sandy peninsula at Tahiti's northernmost end and is densely covered with beautiful casuarina trees. Little over a mile from the main road is a beautiful black sand beach surrounded by a charming park full of local plants. There is also a 1868 tall white lighthouse, a snack bar, bathrooms, and a souvenir and handicrafts shop. 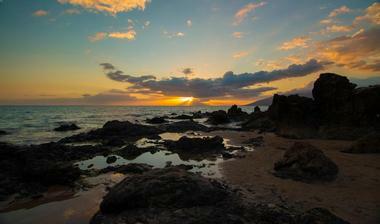 The beach is very popular with picnickers and has a long history. It received its name from Captain James Cook, who in 1769 observed the transit of Venus across the sun from the spot between the beach and the river which transects the peninsula in half. 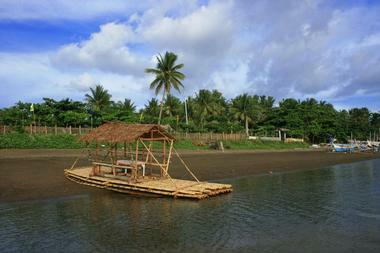 Traveling through the Philippines means enjoying many lovely beaches with fine golden or white sand. However, in the town of Santo Domingo in the province of Albay on the island of Luzon is a rare beach with jet black sand, unique for the Philippines. The stunning contrast between the truly black beach, the azure water, and the white clouds in the clear blue sky is breathtaking. The beach is wide, fringed with tall palm trees, and overshadowed by Mount Mayon, the photographer’s dream. The best time to experience this magical spot is on a clear full moon night, when you can watch the moon rise over the water against the twinkling lights of towns of Bacacay, Legazpi and Tiwi across the Albay Bay. If you travel to Iceland’s southernmost tip, you will find a village of Vik, a small community of only a few hundred people. 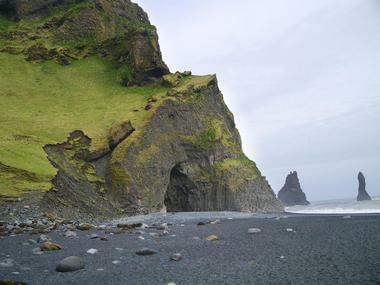 The village beach faces the open Atlantic Ocean, is often pounded by powerful waves and is surrounded by dramatic Reynisdrangar rocks. 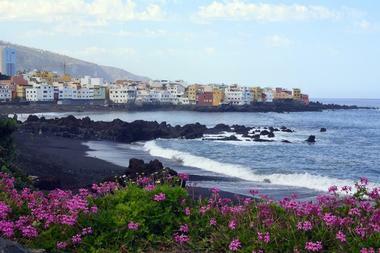 The beach is famous as one of the most beautiful non-tropical black sand beaches in the world. The fine black sand is of volcanic origin – no surprise on Iceland, an island that is full of active volcanoes. One of the most popular and most spectacular beaches in Alaska is Black Sand Beach in Prince William Sound. About ¼ of a mile long and quite wide, it is a favorite place for kayakers during the summer when they come to camp and explore the surrounding majestic tidewater glaciers. As you stroll along the coarse black sand, you can enjoy a magnificent view of Barry Arm, with water cascading off the glaciers overhanging the beach and majestic mountains in the background. It is not uncommon to see glaciers beached on the black sand. At low tide, more of the coastline becomes exposed and it is possible to explore from the beach to the surrounding cliffs. A short paddle away from the beach you can find huge rocks exposed by the glacier, which has retreated by more than ¼ of a mile.